Grab your hats and tick-or-treat baskets – fall festivities have arrived in Greater Kennedy Plaza! 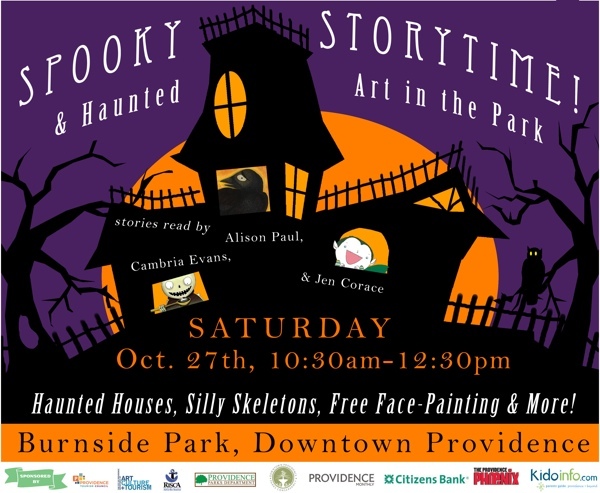 On Saturday, October 27th we are thrilled to host the first-ever Spooky (but Not So Scary) Kidoinfo Storytime & Haunted Art in the Park in Burnside! Don’t miss a morning of family fun, spooky stories, ghostly games and Halloween art. Come in costume and get a treat! Author/illustrator Alison Paul’s The Crow: A Not So Scary Story, an ode to Edgar Allen Poe’s The Raven for kids is about a girl who spies a crow outside her window – and what happens when you let your imagination run away with you! Cambria Evans, author/illustrator of Bone Soup, a Halloween “Stone Soup” inspired tale about Finnigin the monster – an itinerant Eater, carrying his eating stool, spoon and, of course, “gigantic eating mouth” with him wherever he goes! Jen Corace, illustrator of Gibbous Mooney Wants to Bite You!, a story about an incorrigible young vampire who cannot wait to try out his new grown-up fangs. Other featured spooky books include Creepy Monsters, Sleepy Monsters: a Lullaby by local favorite, illustrator Kelly Murphy and our guests’ Halloween-themed favorites! 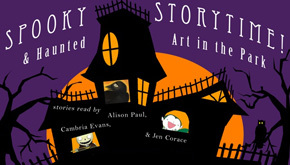 Stick around after stories for HAUNTED ART IN THE PARK… and more! The fun continues with games, crafts and activities for ghosts and goblins of all sizes! Get crafty and decorate an interactive haunted house at a very Haunted Art in the Park with artist Alison Paul. Meet Mr. Bones, our life-size human anatomy skeleton (and his guts!) as educator Nora Barre explains the function of bones and explores human anatomy! Spookify the park with our silly skeleton craft! Play in the Spooky Playground! And enjoy hot apple cider and delicious fall treats from the Rocket Fine Street Food truck! Come in costume and get a special treat! Books for sale & signing by Books on the Square. For sneaky updates and more spooky details visit us on the Facebook event page! Spooky Storytime hosted by Greater Kennedy Plaza & Kidoinfo!